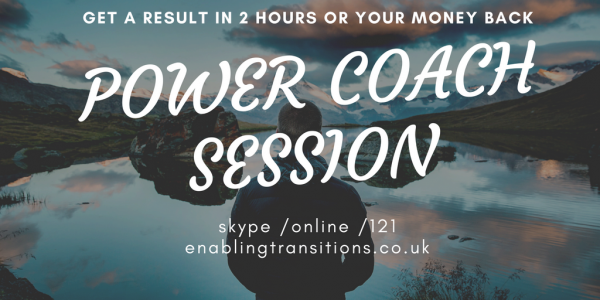 What is a Power Coaching Session? My Power Coaching Sessions are all about finding a rapid solution or way forward to a particular problem you may have. It doesn’t matter what this problem is, or the topic it is about. The intuitive way I work means that I can help you move forward. Some people say I have a sixth sense. Ok I’m not a magician so if your goal is to become a millionaire then you might not be a millionaire at the end of 2 hours BUT you will have some doable actions to move forward towards your million. 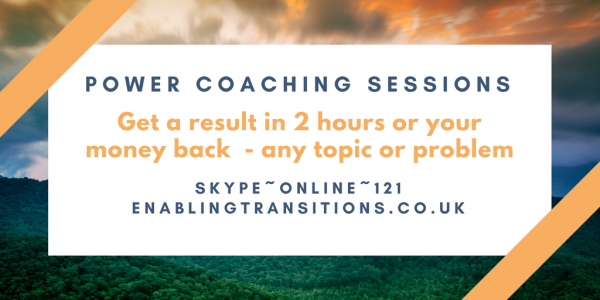 Change can be achieved in the 2 hours but also you can have more sessions if you want. Various packages are available. It is entirely up to you. I’m so confident I can move you forward I offer a money back guarantee. There really is nothing to lose and everything to gain. These sessions can take place via skype (video or phone), mobile phone or in person (if you are local to Preston). Before the session you will be asked to outline what you want to work on in the session and what you want to achieve. The session will feel like you are having a conversation. I don’t use a particular model or approach. My training is diverse so I will adapt to you as an individual and do what’s best for you. Power Coaching sessions also include some follow up to support you moving forward. One Power Session can make the difference. Packages available. Book now and change your life. Print article This entry was posted by Denise on March 27, 2018 at 7:42 pm, and is filed under Coaching. Follow any responses to this post through RSS 2.0. Both comments and pings are currently closed.